You are here: Home / Green Living / How to Repurpose Old Wooden Spoons Instead of Throwing Them Away! How to Repurpose Old Wooden Spoons Instead of Throwing Them Away! For the last few weeks, I have been purging my home of everything that is too old, unneeded, broken, or just plane not useful. It has not been a small undertaking…clutter seems to lurk in every nook and cranny these days. The hardest part of decluttering your home is to figure out what you need and what you don’t. If you haven’t used it in three years, it is pretty obvious that you don’t need it, right? But what about things you use every day that are showing their wear and really need to be replaced. Do you keep the old ones ‘just in case’? Donate them to charity? Throw them in the trash heap? I decided to invest in some new cookie sheets and turned one of the old ones into a DIY Upcycled Cookie Sheet Memo Board rather than just donate it to Good Will. One other thing in my kitchen that really needs replacing is my set of wooden spoons. They are about 15 years old and have pretty much turned black with age! I decided to figure out a few things I could do with old wooden spoons once I buy myself some new ones. 1. Ask Yourself if your old wooden spoons can be saved. Old wooden spoons are discolored because they have spent years absorbing the oils from the food you cook. Take a piece of sand paper to your wooden spoon and try sanding off the top layer of wood. Then, treat your old wooden spoons with a little bit of homemade wood butter. In the image above, I sanded and oiled the spoon on the left. It definitely shows improvement compared to the one on the right. This one might last a few more years! 2. Turn your old wooden spoons into garden markers: Just add a touch of outdoor paint and use these to mark your garden plants. Use a paint marker to write down the particular plant you are marking so you don’t forget what you planted where! 3. As a garden helper: Use the handle of your old wooden spoon to create holes for seeds to be planted in. Use a permanent market to mark off 1 inch increments on the handle so you know how deep you are planting your seeds. 4. Give them to your children: Wooden spoons make wonderful noise makers along with an old oatmeal container or a tin can filled with beans. You can also have your daughter turn your old wooden spoons into a fairy want with some pink paint, glitter and ribbon! 5. Use them in a DIY bird feeder: Using only a plastic 2 liter bottle, a couple wooden spoons, and a craft knife, you can turn your old wooden spoons into a cute upcycled bird feeder. Check out this birdfeeder on Pinterest for directions! 6. Cabinet Deterrent: If you have a pet that can easily open a cabinet door, just thread an old wood spoon through the handles to keep it closed. 7. Use the handle as a paint stirrer: Who needs those free paint stirrers from the hardware store when you have an old wooden spoon in your kitchen drawer! 8. Turn them into wooden spoon puppets: Either you can do this yourself and give them to the kids to play with or have the kids get creative and decorate them however they want. Do you have any other creative ways to upcycle your old wooden spoons? These are great ideas. I need to do a little decluttere in my closet, it's down right scary in there! Great ideas! I like using them as garden markers and my toddler has sure enjoyed playing with them for the past year. The puppets have endless possibilities. Might be a good craft with my son when he gets older. 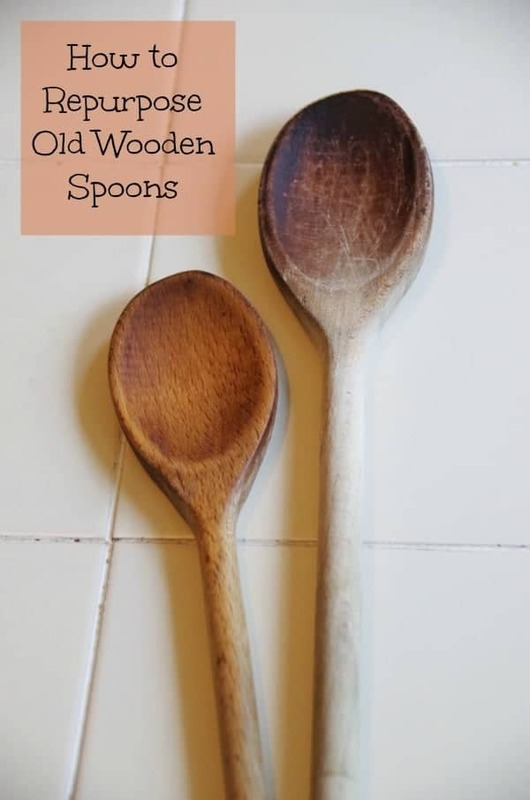 I don't know, I prefer to use the old wooden spoons over the new ones. The darker it is, the more experience it has. Expert versus newbie. I'm reaching for the expert every time. LOL Until someone tells me it's harboring 20 years of bacteria, then I might change my tune. I must admit, my daughter bought me new ones and it is REALLY hard to get used to them! There is definitely something comforting about a well used wooden spoon!